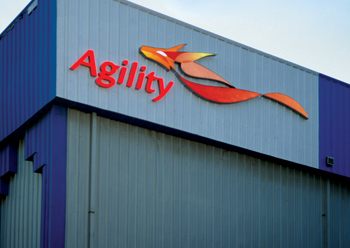 Kuwait-based Agility, which recently announced a 5 per cent increase year-on-year both in its Q3 and January to September profit, has been awarded a contract by Abu Dhabi National Exhibitions Company (Adnec). The contract requires Agility to manage Adnec’s international freight and provide on-site handling services for the 2017 and 2019 editions of the International Defence Exhibition and Conference (Idex), the Naval Defence and Maritime Security Exhibition (Navdex), and the 2016, 2018 and 2020 editions of the Unmanned Systems Exhibition and Conference (Umex). The announcement is an immediate outcome of the five-year partnership that Agility Fairs & Events signed with Adnec in August this year towards providing logistics and freight forwarding services to its customers. As exclusive freight forwarder and on-site handling agent for the three major defence shows, Agility Fairs & Events will assist exhibitors and their contractors with logistical requirements and with shipment of exhibits to and from the events. Adnec offers 133,000 sq m of inter-connected floor space to match the expectations of a wide variety of events and exhibitions. The venue attracted 1.6 million people across 327 events in 2014. Agility Fairs & Events handles more than 1,000 major trade fairs, exhibitions, and events each year. Agility reported a Q3 net profit of KD13.7 million ($45.04 million), an increase of 5 per cent compared to the same quarter of 2014. For the first nine months of 2015, the company’s profits were KD39 million, a 5 per cent increase from the same period last year. Revenues were at KD981.5 million and EBITDA was KD73.3 million.